A labor of love for Atlanta filmmaker, Mike Malloy, who researched, wrote, directed, produced, edited and even contributed a small amount of instrumental funk to the score, EUROCRIME! 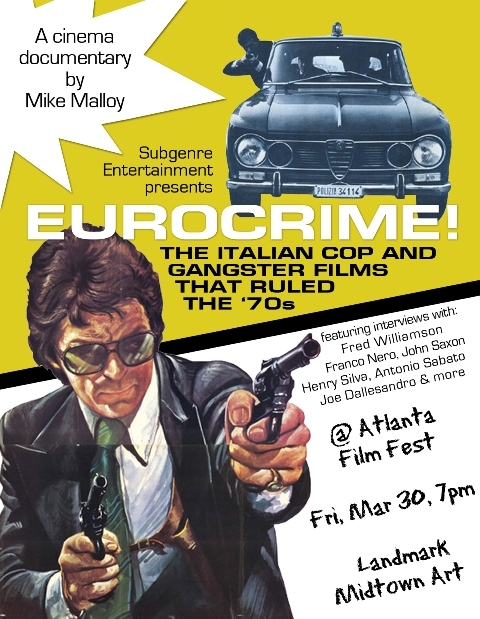 THE ITALIAN COP AND GANGSTER FILMS THAT RULED THE ’70s screens at the Atlanta Film Festival on Friday, March 30 at 7 p.m. at the Landmark Midtown Art Cinema. EUROCRIME! 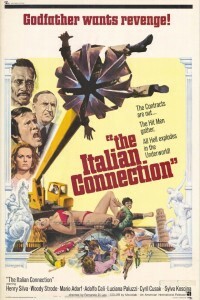 is a feature-length cinema documentary concerning the violent Italian ‘poliziotteschi’ (a literal translation is “policesque”) cinematic movement of the 1970s which, at first glance, seem to be rip-offs of American cop/crime films like DIRTY HARRY or THE GODFATHER, but which really address Italian issues like the Sicilian Mafia and red terrorism. What sets these movies apart from American cop movies of the era were the rushed methods of production (stars performing their own stunts, stealing shots, no live sound) and the dangerous bleed-over between real-life crime and movie crime. EUROCRIME! is an excellent, exhaustively researched, fascinating chronicle of this action-packed sub-genre of low budget Italian cinema. ATLRetro scored an exclusive interview with the busy movie maker earlier this week. ATLRetro: What inspired you to make EUROCRIME? Mike Malloy: I got my first book contract – to write a cinema biography [of Spaghetti Western star Lee Van Cleef] – when I was 19, and over the next decade, I was slowly but surely building a career for myself writing for movie magazines [(FLAUNT, FILMFAX, VIDEO WATCHDOG, etc] and for newspapers [AP, Knight-Ridder, SUNDAY PAPER]. Then, one morning in 2007, I woke up and learned that the whole world had apparently decided overnight that film journalism was no longer going to be a paying profession. So I decided to try to parlay my film commentary into cinema documentaries. The Eurocrime genre was my cinematic fascination at the time, so I made a three-minute demo video, and a colleague got it in front of an acquisitions VP at a major cable broadcaster. They said they’d be interested in buying the broadcast premiere if I could get it made. That allowed me to jump headlong into the project. Mike Malloy dons a police badge himself in an acting role. Photo courtesy of Mike Malloy. 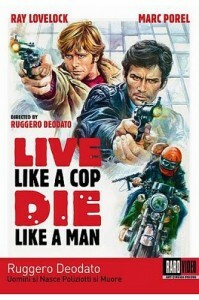 Looking back, I see what caused me to fall so madly in love with Eurocrime movies. I love cinema that rings true to life. And it may seem strange to say this, considering the Eurocrime genre’s over-the-top violence and action, but these movies are about as real as it gets. And that’s because of the way they were made. Sometimes the organized crime down in Naples got involved in producing these films, so you got a pretty hairy blurring of real-life crime and movie crime. And because the leading men of these films – even big international stars – performed their own dangerous stunts, the action had a certain authenticity to it too. How long did it take to make EUROCRIME!? Getting the interest from the broadcaster launched me on a four-year odyssey. I know nothing about raising money, and I was in a bad place to do it anyway, as these movies weren’t experiencing the revival here in Atlanta that they were in places like Los Angeles and Austin. So I just did the doc on my own, basically, with a few small private investments and with some help from some colleagues who also loved these movies. And I ended up starting the project Standard Definition and starting over midway as HD, teaching myself all the necessary editing and VFX software along the way. Having no real budget meant that most of the things that other pop-culture docs farm out – like stylish, graphics-oriented opening credits sequences – I just had to do myself. In fact, because I realized that many of our filmmaker interviews were shot on the fly and with less-than-ideal circumstances, I wanted to compensate by creating as many graphics, montages and other touches of style as possible. I started the doc in my living room and finished it in the upstairs of my fiancée’s parents house, as this project even cost me my ability to pay my rent for a while! How did you obtain all the amazing footage (in addition to all the great interviews)? These films have gotten some pretty great-looking DVD releases in other parts of the world. So it’s a matter of finding those good-looking releases, than finding cruddy-looking gray-market copies of the same films with English dialogue, then matching up the good-looking print and the English audio. Of course, NTSC (North American) and PAL (European) video run at different speeds, so it takes plenty of trial-and-error adjustments to sync it. We also were very grateful to receive some 8mm home movie footage from one of our interviewees – John Dulaney. And we got some other cool materials from people like Italian cinema documentarian Federico Caddeo. Wasn’t Quentin Tarantino supposed to be involved at some point? We were interested in interviewing him regarding the important part he played in the revival of these movies, setting up Eurocrime screenings at The New Beverly inLos Angeles, the Alamo Drafthouse in Austinand at events like The Venice Film Festival. He said yes a couple times to the project, but we never could make it happen. I’m now in production on PLASTIC MOVIES REWOUND: THE STORY OF THE ’80s HOME VIDEO BOOM. And I’d like to do DAVID CARRADINE: THE LOST AUTEUR. Where would intrigued viewers of the doc go to find these movies? Last time I checked, Videodrome on North Avenue had a Eurocrime section. 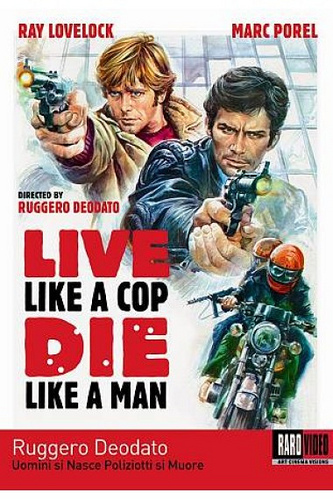 And the longtime Italian DVD company, RaroVideo, just started releasing some of their titles in theU.S.last year -movies like THE ITALIAN CONNECTION and LIVE LIKE A COP, DIE LIKE A MAN. And for years now, the U.S. DVD label Blue Underground has been championing Eurocrime movies in the U.S., releasing films like STREET LAW and THE BIG RACKET. All these titles from Raro and Blue Underground are available through Netflix, too. Contributing write Philip Nutman, is a long-time film journalist, author, screenwriter and occasional director. He recently produced the forthcoming, controversial zombie love story, ABED, in Michigan.